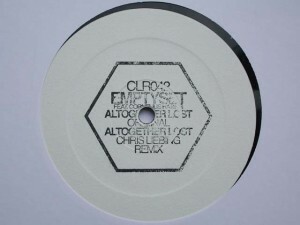 In my view a surprise collaboration on Chris Liebing’s label CLR. Emptyset did the album debut a few years ago, searching for experimental hardness and since that not much have been heard about the duo. Would not have tipped CLR the label that welcomes new material by Emptyset but the job Ginzburg and Purgas have done here is excellent. Having on board Cornelius Harris, a member of the UR camp and known as The Unknown Writer, adds special meaning to the release and, with the voice and rhyme part by Harris, the result can be filed under Techno Meets Poetry. Harris’s suggestive performance rules the A-side where intense textual part is complemented by Emptyset’s bassful and distorted music that partly sounds like a giant insect crawling on a sheet of thin paper. B-side is remixed by the label boss himself who reformatted the track for big-room purpose. Indeed, this is a release that has power within.